Mother ships at Corfu, Plymouth, and Queenstown relayed the message to the chasers: The Armistice had been signed. "All Allied man-o-war. The armistice is signed. Hostilities to be suspended forthwith. Submarines on the surface are not to be attacked unless their hostile intentions are obvious." 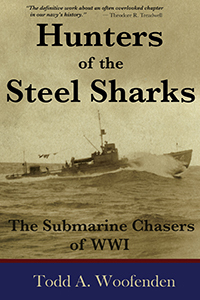 In 1918, a war time fleet of 303 U.S. submarine chasers formed a new offensive against the enemy, armed with depth charges, deck guns and an array of new, top secret submarine detection and pursuit devices. These miniature wooden war ships, the smallest commissioned vessels in the American navy, were the first major deployment mechanism for early antisubmarine warfare equipment, and were remarkable in their capabilities and service: Chasers crossed the Atlantic Ocean on their own power; performed submarine hunts and attacks from bases in Plymouth, Queenstown (Cobh) and Corfu; assisted with post-war diplomacy along the eastern shore of the Adriatic Sea; helped facilitate troop evacuation in northern Russia; and participated in the clearing of the North Sea mine barrage. This is the history of the submarine chasers of the Great War, extensively illustrated with period photographs and diagrams, and rich with personal anecdotes, an up-close account of the early days of ASW based on rare, unpublished documents.